A Moment of Reflection is one of Kat and Ana's microgames in WarioWare: Smooth Moves. "The Chauffeur" form must be used when playing the game. It returns in WarioWare Gold as one of Ashley and Red's microgames. The player's objective is to direct the light beam, reflecting it with a mirror, to the nearest character's head for a few moments. The mirror can be rotated by turning the Wii Remote left or right. 1st level difficulty: The targeted person is standing still to the left side and there are no additional mirrors. If the player accomplishes the task, the person's hair will burn off. In WarioWare Gold, the blue spirit will transform into a yellow figure. 2nd level difficulty: The targeted person is standing still to the left side and there is one additional mirror. The player is supposed to direct the beam to the second mirror, which will then shine on the nearest character's head, causing them to grow hair. However, using the second mirror is not necessary to win the game. In WarioWare Gold, the yellow figure will grow hair. 3rd level difficulty: The two characters are instead on the right side of the screen, moving back and forth. 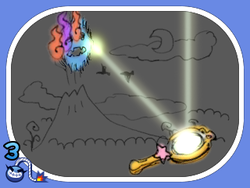 Similarly to the second stage, there is an additional mirror to direct the light beam to before shining it on the character's head, but again using the second mirror is not necessary to win the game. Winning the game will turn the person's hair into a rainbow, stretching across the screen. In WarioWare Gold, the yellow figure will evolve into a doodle resembling Mona, Ashley, or Penny. This page was last edited on January 19, 2019, at 03:23.